An ultra-thin coating material capable of extending the life and enhancing the efficiency of lithium-sulfur batteries, currently considered to be one of the most promising energy-based research areas, has been developed by Yale scientists. A description of the new material, a dendrimer-graphene oxide composite film, has been presented by the researchers in an online study published on March 20 in the Proceedings of the National Academy of Sciences. It is possible to apply this new material to any sulfur cathode. The researchers highlight the possibility of stably discharging and recharging sulfur cathodes coated with the material for more than 1,000 cycles, improving the efficiency of the battery and the number of cycles. Our approach is general in that it can be integrated with virtually any kind of sulfur electrode to increase cycling stability. The developed film is so thin and light it will not affect the overall size or weight of the battery, and thus it will function without compromising the energy and power density of the device. Wang is also a faculty member at the Yale Energy Sciences Institute at Yale West Campus, and lead investigator of the study. Positive and negative terminals, also known as new types of electrodes, are considered to play a significant role in the production of a new generation of high energy-density batteries. Many researchers treat lithium-sulfur to be a solution as lithium-ion batteries start to reach their capacity limitations. Sulfur has a high theoretical energy capacity and is both abundant and lightweight. However, a loss of capacity during cycling is experienced by the existing lithium-sulfur battery technology. The Yale scientists made their discovery by integrating the distinct properties of two material components. The mechanical strength of graphene oxide was merged with the ability of a dendrimer molecule in order to confine lithium polysulfides. 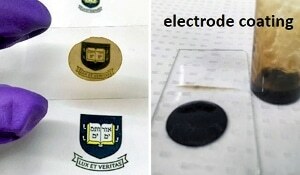 The end product is a gel-like slurry capable of being readily coated as a 100-nanometer-thin film onto sulfur electrodes. The corresponding authors of the study include Gary Brudvig, the Benjamin Silliman Professor and chair of chemistry, professor of molecular biophysics and biochemistry, and director of the Yale Energy Sciences Institute at Yale West Campus; Yale chemistry professor Victor Batista; and Wang. Co-authors of the research are Wen Liu, Jianbing Jiang, Ke R. Yang, Yingying Mi, Piranavan Kumaravadivel, Yiren Zhong, Qi Fan, Zhe Weng, Zishan Wu, and Judy Cha, all of Yale, and Henghui Zhou of Peking University.